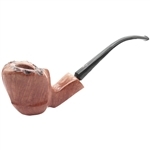 Brown Marble Rhodesian Briar Pipe - Full Bent - Made by Vector the pipe is stamped "St. Claude France 833" on the shank. The pipe has a beautiful lacquered finish. 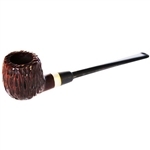 The full bent stem is made of Vulcanite for good looks and long lasting durability. 100% satisfaction guaranteed. Pipe comes in a Vector branded velvet lined box and includes a soft black drawstring pouch.